AT INVERALLOCHY WITH A 59! Newmachar amateur Gordon Munro more than lived up to his +3 rating by returning a bogey-free, five-under-par 59 over the Inverallochy Golf Club winter course to win the top prize of a £150 voucher at today's (WED) North-east Golfers' Alliance fixture, the first of 2018. Munro, pictured, headed a field of 85, pipping Newmachar clubmate and tour professional John Duff whose round of 60 included a hole in one with a seven-iron at the 145yd second hole. It was Duff's fifth career ace. It was Munro's second win of the NE Alliance season but his first outright win of the 2017-2018 circuit. Munro's scorecard included one 2 (at the fifth) and 11 3s in halves of 30 (three under) and 29 (two under). 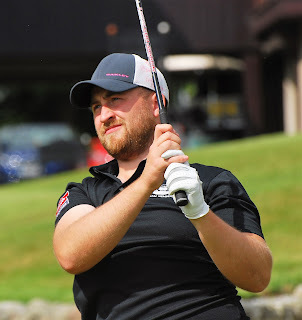 Duff, who earned £120, bogeyed the sixth and eighth but still had a chance of breaking 60 until he bogeyed the 18th for halves of 30 both ways. In all, five players got under the par of 64 - David Law and Philip McLean were joint third on 61 and Laura Murray had a 62. As organiser Michael MacDougall commented: "OK, so it was a shorter course than usual but any scores under par deserve praise." 61 D Fleming (5) (£70). 62 J Nicolson (4) bih (£60), B Ritchie (3) (£50). 63 C Craig (7) bih (£40), J Stewart (8) (£30). 63 N K Parker (14) (£70). 64 J Scott (9) (£60). 65 M Rogers (18) bih (£50), D Booth (9) bih (£40) G Leslie (10) (£30). 65 S Finnie (Caledonian), B Ritchie (Inverallochy), Sean Lawrie (Paul Lawrie GC), B Fyfe (Paul Lawrie GC). 66 D Fleming (Portlethen), B Nicolson (Newmachar), J Nicolson (Newmachar). 68 J Hopwood (Royal Aberdeen), K Zeynalov (Portlethen), K Nicol (Dunes Golf Centre). 70 D Templeton (Murcar Links), C Craig (Kintore), S Kiloh (Paul Lawrie GC), R Davidson (Caledonian), I Still (Craibstone), R Reid (Tarland). 71 J Stewart (Banchory), P McKenna (Paul Lawrie GC), W Middler (Peterhead), R Sinclair (Kintore). 72 D Leslie (Bon Accord), S Mackie (Kemnay), B Elsby (Peterculter). 73 P Cheyne (Northern), J Scott (Peterculter), R McNeill (Westhill), K Bedborough (Deeside), S Shand (Kemnay). 75 Grant Leslie (Newburgh), B Harper (Newburgh), R Lamb (Newmachar), Steve Lawrie (Portlethen), R Ruddiman (Royal Aberdeen). 76 M Duncan (Murcar Links), D McLean (Kemnay). 77 A Campbell (Murcar Links), S Allison (Bon Accord), A Gall (Deeside), N K Parker (Murcar Links), D Bisset (Banchory), J Borthwick (Craibstone). 79 S Davidson (Kemnay), G Thom (Murcar Links), M Forster (Cruden Bay), J Barclay (Hazlehead), M Tough (Banchory), P Cornfield (Newmachar). 80 I Birnie (Deeside), D Townsley Peterculter), C Cassie (Nigg Bay). 81 G Burnett (Westhill), W Skene (Deeside). 84 D Lawrie (Deeside), J Forrest (Northern) . 85 R Coupar (Inverallochy), L Roger (Royal Aberdeen). 86 M Brown (Kemnay), R Duncan (Deeside), M Smith (Newmachar), N Stewart (Northern).